Click here for Focus Stacking Photomontage in Microscopy. Modern image presentation benefits greatly from the use of well-known focus stacking photomontage, i.e., the taking of a plurality of images at successive focal distances, followed by mathematical processing and combining of the images to produce a resultant single image with an extended depth of field (DOF). This is useful when viewing scenes whose visible features lie at various depths greater than the depth of field of a telescope. In the past, images to be included in a stack were taken one-at-a-time. A first image was taken, then the focus of a telescope was changed and a second image was taken, and so forth. The images were then submitted to a software program for processing and focus stacking into a final result. This process works well, however it takes time. We have developed a system and method for taking a plurality of images at video rates, i.e. at many tens of images per second, without the need for manually refocusing a telescope between shots. Our system greatly increases speed, convenience, and workflow in obtaining images with an extended depth of field. Moving subjects and panning of scenes are possible. There are many new possibilities with our new, fast photomontage system. A detailed description of our system is contained in our U.S. patent 8,212,915 and in white papers at: Relay Lens and Video Photomontage. Our system also applies to cameras, microscopes, binoculars, and monoculars. How it works: In one version of our system, a variable focus lens (VFL) is inserted between the camera adapter of a telescope and a DSLR camera, in this case operating at a video rate. A control unit adjusts the focus of the variable focus lens with each image taken by the sensor. A series of images, each at a different focal depth, are then processed in software. After processing, an in-focus image is delivered to a display and storage unit for viewing and saving. Some examples of images taken using our image acquisition system are shown below. More examples will be added periodically so be sure to check back. 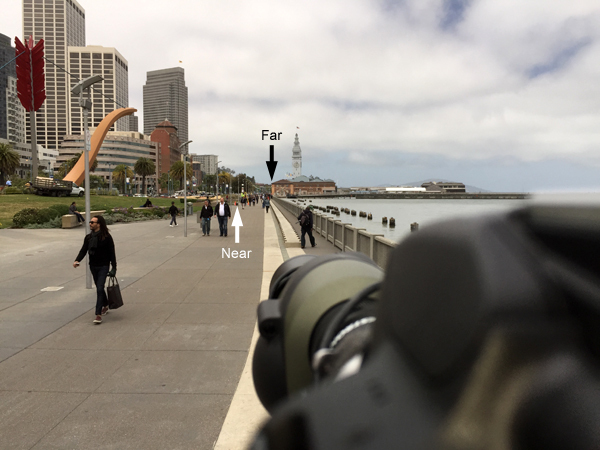 Treasure Island, San Francisco: This video shows the acquisition and result of stacking of 37 images with focal distances extending from about 100 feet to 1.7 miles (30.5 m to 2.7 km). The 37 images were acquired in about 0.6 sec at a rate of 60 Hz. Local tree, distant buildings: This video shows the acquisition and result of stacking of 19 images with focal distances extending from about 100 feet to 3.7 miles (30.5 m to 6 km). All 19 images were acquired in about 0.32 sec at a rate of 60 Hz. Golden Gate Park, San Francisco: This video shows the acquisition and result of stacking of 32 images with focal distances extending from about 60 ft to 500 ft (18 m to 150 m). All 32 images were acquired in about 0.5 sec at a rate of 60 Hz. Golden Gate Park, San Francisco: This video shows the acquisition and result of stacking of 48 images with focal distances extending from about 20 ft (a fern tip on the left-hand side of the first frame) to 100 ft (6 m to 30 m). All 48 images were acquired in 0.8 sec at a rate of 60 Hz. Focus bracketing is used to select a single in-focus image from a collection of images that are focused in front of, through, and behind a subject. This is useful when a camera’s autofocus is either unable to fix on a subject or when a subject moves too rapidly for the autofocus function to track the subject. In the example below, a bird is resting on land. The spotting scope is focused at a point in front of the bird and then a collection of 16 images is taken at successively longer focal distances. In this case, 16 images were captured in under 0.3 second. In the video below, the box at the left represents a camera, the oval represents a subject being photographed, and the moving vertical lines represent a plurality of focal distances. The series of images to the right are obtained at the indicated focal distances from the camera to the subject. The image with the best focus is shown at the end of the video. Focus sweeping is useful in the long-range surveillance of scenes. Figure A below shows a surveillance camera with a fixed focal depth indicated betweeen two vertical lines. A camera's limited depth of field is extended by moving the focal distance in a controlled manner. Figure B shows the limited focal depth of the camera being swept nearer and farther from the camera so that a greater range is seen in focus. With the additional focal range acquired in DOF increments, frame-grabbing facial recognition and optical character recognition software can quickly capture much more data over greater distances than was possible in the past. The slow motion video below shows the use of focus sweeping in the surveillance of a crowd. The video was obtained using the camera, relay lens assembly, and terrestrial spotting scope at the top of this page. A total of 18 overlapping-DOF images are included in each sweep of the focal depth. The 18 images were acquired in 0.3 sec at a rate of 60 Hz. The image below shows the position of the camera and scope in relation to the above scene. 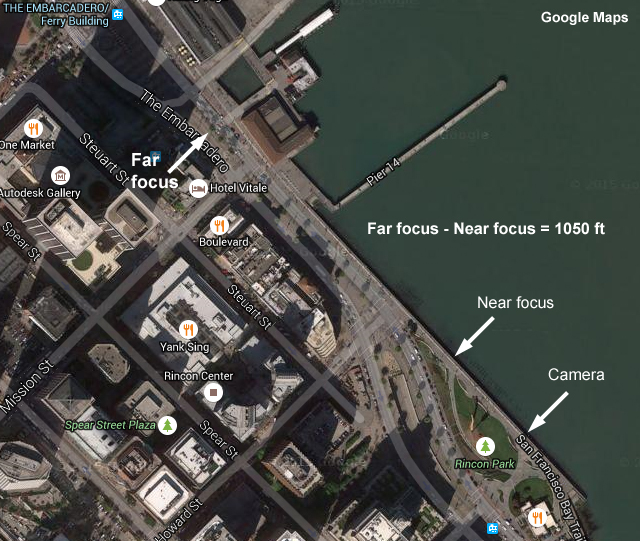 The near and far focus points are indicated. The image below shows a plan view of the above scene. The near and far focus points are indicated. They are separated by about 1050 ft (320 m). In the video below, subjects at different focal distances are selected and their images are captured for facial recognition. For more information contact us at info@paedia.com, or click the Licensing link below.